This is a very odd pet, indeed and definitely one of the most unique virtual pets I have ever played with. I finally played with it for the first time since buying it a few years ago. 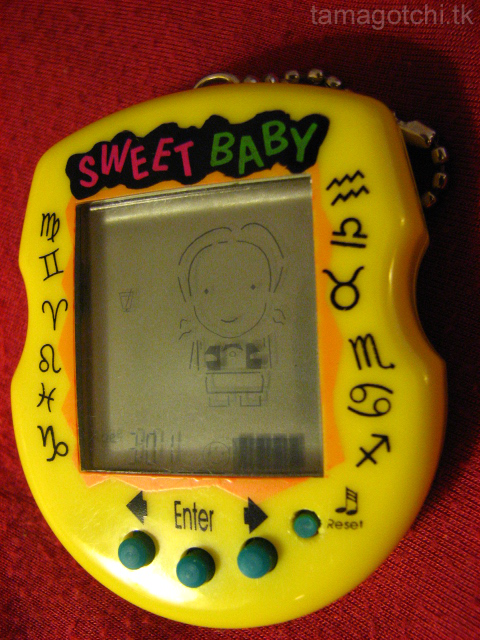 My sister originally got this pet for about $8 in the 90's when pets were popular. She purchased it at a drug-store. 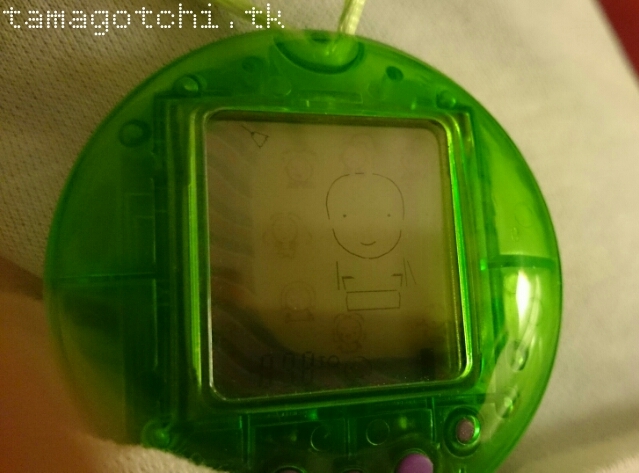 We had no idea how it worked and were thoroughly confused by the directions, mostly because they were in Engrish :3 hehe Somehow my sister lost this pet (it may have been traded or given away or perhaps sold in a garage sale, who knows), so I decided to go on a hunt for it on eBay. After years of periodically searching and coming up with nothing I FINALLY found it (I spent a long time searching for the Octo-pet and the Lovely Bear, too). It was relatively cheap, somewhere between $10-20. Not sure of the price tag since I bought it about 3 years ago or so. After reading the directions I found that it had different growth charts depending on how you raised it. Your baby might turn into a good child or a rebellious punk, depending on its mood. It also has a unique feature in that it does not have the standard pixelated screen. The baby is made up of different lines and shapes that change its facial expression, hair and clothes as it grows. A very interesting concept to say the least. The beeping is very low and soft and not that annoying. The shape is a bit ugly in my opinion. The Sweet Baby my sister owned had a sort of plainer logo on it, but this one is a bit more decorated from what I remember. Its still the exact same pet, though with all the same functions I believe. Its a good pet if you are looking to experiment with something different than the standard two row menu, clock pet. Here is what happened when I finally played with it a couple of weeks ago. I started it up and read the directions very thoroughly. It has a clock feature, which shows the regular time. The baby usually sleeps at the same time you do, except for when its first born. When it was born it seemed to stay awake all night and lost a lot of happiness and health because I was asleep. Luckily it didn't die, but I had to spend quite a bit of time giving it care to get its vitals back up. The baby seems to put on more and more clothing the better you take care of it. If you neglect it it because rebellious and seems to want to wear skimpier clothing (thats my interpretation). It has a food icon, which is probably a rice bowl, a candy icon and a drink icon. when its first born it only wants to drink. After the first year it will take rice and candy. The candy makes its IQ go down. Reading and playing the game will make its IQ go up. The game is rock-paper-scissors and can't be played until it grows a little bit. It enjoys being cleaned from the very beginning, which is how its happiness goes up for th emost part. when it needs something it will show a sort of towel icon to indicate its hungry. If it needs some other type of care a sad face will appear. One thing I noticed is that it is difficult to tell what the child needs. There is never any sort of medical aid icon that pops up indicating it is sick. I don't think it ever ran away, but I disciplined it a couple of times after not being able to figure out what it needed after it got older. As it ages it seems to get more rebellious when you play with it. If you read to it a lot it becomes more modest and grows longer hair and puts on a longer skirt. The "runaway" icon never appeared when I played with it. Another odd thing is that the sound button is also the reset button. If it press it for a millisecond the sound turns off, and on, but if you push it for too long the baby restarts completely. I didn't want to turn the sound off at all for fear of it restarting, but luckily the beeping is so low that it didn't irritate me anything. All of the vitals can be monitored at the bottom of the screen, which displays a heart for health, a happy face for happiness, IQ for intelligence, age, weight and time. Not all vitals are displayed at once however, so you must scroll through them to select. Its a bit odd but you'll see what I mean when you start it up. Something I didn't like about it is that it doesnt move around the screen. The only actions it does it stay still and move its face or change styles. 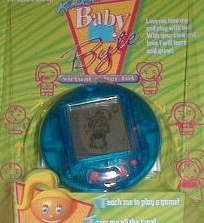 It doesn't even show the baby playing when you choose the game. It shows the baby's face moving when it eats, sleeps or expresses emotions, but thats it. the body just seems to be there for the sake of the clothes. On the other hand, the pet is sufficiently unique and interesting enough in its options for it not to matter too much. Interestingly, after about 4 or 5 years it suddenly went back to infancy. I know I didn't accidentally restart it because the time was not changed, so... yeah.... weird. I dunno if thats a good thing or a bad thing, though. I give this pet a 7 out of 10 for being unique, but it could have been an 8 or a 9 if it had better animations. Its uniqueness is what saved it from being anything lower than a 7. The sound/reset button is weird/annoying, but manageable. This is a used one I just bought off of eBay for $8. It seems to function exactly the same, but with a nicer shell, background and different sized screen. As you can see, its shell resembles the Bobo Panda Byte since they are made by the same company. Coming soon, after I scan the directions.